The program has five conferences, which will take place every penultimate Thursday of the month, at 6:30 p.m. According to the Israeli writer Amos Oz, there is no more authentic European than the Jew. Undoubtedly, the Jewish people have contributed as few to the conformation of the idea of Europe. We have found them on the European continent since ancient times. Not only that, in some key moments of European history the figure -or the myth- of the Jew has been the center of all the glances and reflections on our continental identity. 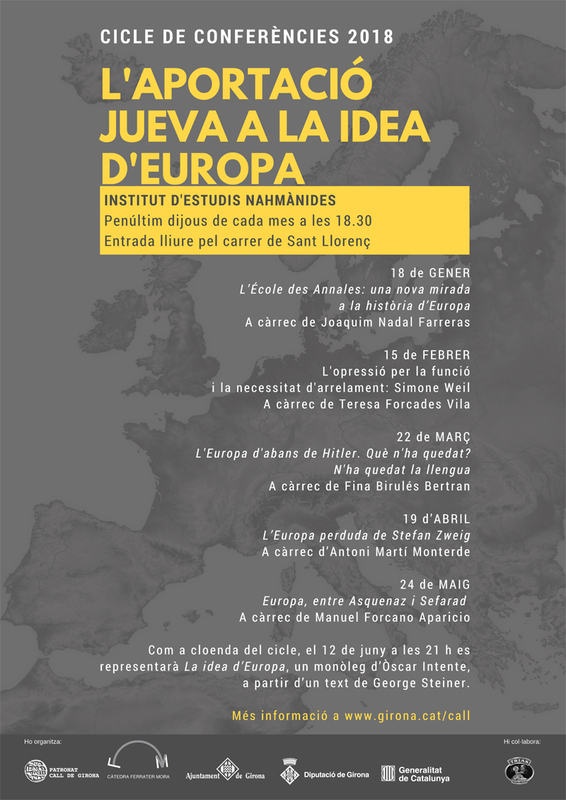 On Thursday, January 18, Joaquim Nadal will open the cycle with a lecture on the new way of understanding and writing the European history, based on the perspectives and methods proposed by the École des Annales, founded at the end of the 20s of the twentieth century by the historians Marc Bloch and Lucien Fevre, both of Jewish origin.